JAPANESE GARDEN GUIDE to Styles, Design, Zen , Lanterns and Plants. 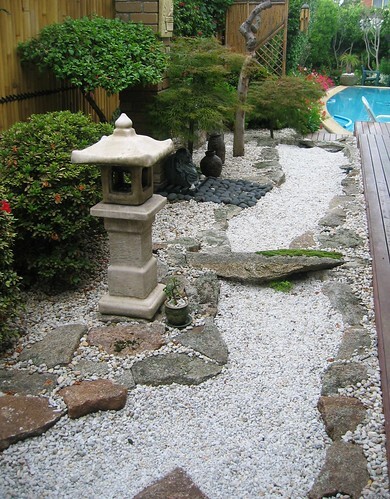 Hi, my name is Peter Richardson in Melbourne,Australia and Yes I have a Japanese Garden "down-under"!See the picture below. 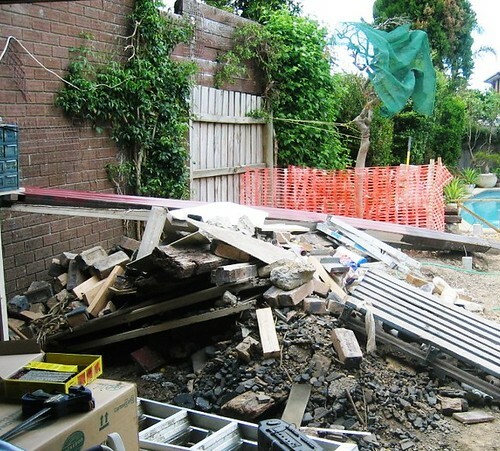 THIS IS HOW IT STARTED IN OCTOBER 2006 ... A ZEN GARDEN ?!! Having visited Japan many times since 1982 and seen gardens of various designs and styles I decided to build a courtyard styled garden. As you can see above that was in October 2006,what I have tried to do on this site is to start to catalogue all the ideas and research carried out over the years since then. The big question .... How do I start making a Japanese garden? Followed by ...How do I start my garden design plans? What plants do I consider? Do I build a typical garden path or complex ones as seen at KATSURA in KYOTO that tease the mind? What style suits the site and space available? Zen or courtyard style? How do I blend in rocks, bamboo, lanterns and ornaments? Can I create a water garden? Do I need to know FENGSHUI ? What plants do I use? Some of the questions I needed answers to before building my “tranquil sanctuary”. The answer is not to "transplant" a copy of a garden in NARA or to create your own hybrid version but to understand the history of Japanese gardens and what the real "nitty gritty" aim is of the creation of the style. To understand this we have to go back into history and understand the social conditions that were prevelant at the time.Please see my link to the HISTORY of Japanese gardens. Development of the Japanese garden started in the 5th and 6th century borrowed from the Chinese/Buddhist culture.An open space was set aside next to the house and was called NIWA which is now interpreted as the English word courtyard to this was added the word SHIMA literaly "island garden".300 years later the Japanese people had developed their own interpretations or some say misinterpretations of the original Chinese culture.Sometimes gardens were built just for pleasure of the master of the house or to entertain the masters lord or even to gain the favour of a lady !Most of this knowledge was passed on in "secret teachings" to a select few and wasn't available to outsiders. "Visualise the famous landscapes of Japan and come to understand their most interesting points. Recreate the essence of these scenes in the garden, but do so interpretatively, not strictly"
The above quotation is from the the first Japanese gardening referance book written by TACHIBANA NO TOSHITSUNA (1028-1094) and was called SAKUTEI-KI, kept secret for centuries and it survives today.So we have alot of prior history and content to explore and add to this site over the next few years. THIS IS TWO YEARS LATER IN NOVEMBER 2008. WOW ! One of my favorite quotations..
“In the garden he wished to create the attitude of a newly-awakened soul still lingering amid shadowy dreams of the past, yet bathing in the sweet unconsciousness of a mellow spiritual light and yearning for the freedom that lay in the expanse beyond” OKAKURA KAKUZO. I wish I had said that - but these quotes explain my intentions! I HOPE THE SUN SHINES ON YOUR GARDEN..regards Peter. Japanese Garden History of more than 1,300 years, created sometimes for the master of the house or to win the heart of a lady! Japanese Garden Styles,Which is for you? How to mix to create your own work of art by capturing nature’s essence. The Japanese Courtyard Garden style explained. A Japanese Courtyard Garden,ideal for that small empty place. Bring outdoor nature indoors. The Japanese dry garden style that is a world within a world. What is in a Japanese-Tea-Garden and how to make one. THE JAPANESE STROLL GARDEN ; A GOOD WALK FOR THE MIND ? Japanese Stroll Garden designed for Princes and Lords. Japanese Garden Design principles and plans for your own site.All made easy! Walk on Japanese Garden Paths and it is like a journey through life;space and time.Magically captured in photos. Japanese Zen Garden.How to create your own. All explained in easy steps. Discover the Japanese Zen garden or dry-landscape style and the factors that make its minimalist art different to regular gardens. The best Japanese Garden Books and the cheapest site to buy from. Japanese-Garden-Lanterns to Light up your Garden or to Create atmosphere? Japanese-Garden-Lanterns. All styles explained from the acient temple to modern solar powered? Japanese Garden Pictures from Melbourne Australia.From a building site to Zen meditation? Would you like to share your knowledge about japanese garden? Great, find out how you can submit your story or tip here. (c) Pacific Rainbow Pty. Ltd. Melbourne. Australia.